While this week’s release of Azadliq newspaper executive director Faig Amirli, Turan information agency director Mehman Aliyev and blogger Alexander Lapshin from their places of detention should be taken as a step in the right direction, it is only the first step. The Institute for Reporters’ Freedom and Security (IRFS) calls on the Azerbaijani authorities to immediately free all other journalists and government critics remaining behind bars. IRFS believes that despite the replacement of the restrictive measure of arrest in Mehman Aliyev’s case to being out on bail, he still faces a potential eight-year prison sentence on trumped-up charges of tax evasion, illegal business activities and abuse of authority. Due to the attachment of its bank accounts and seizure of all its accounting documents, Turan information Agency is unable to pay salaries or to receive or make payments, which has led to the de-facto suspension of its activities. As for the executive director of Azadliq newspaper, despite his release, Amirli, who needs an urgent treatment abroad, is unable to leave Azerbaijan. Moreover, Amirli is unable to restore the newspaper to its full capacity, a,nd their website has been blocked by a decision of Azerbaijani courts and their bank accounts have been frozen by the decisions of law enforcement and fiscal bodies. Furthermore, all printing houses in the country have been declining to publish the only independent newspaper from September 2016 to today. the arrest of the director of Turan independent information agency,” said IRFS CEO Emin Huseynov. 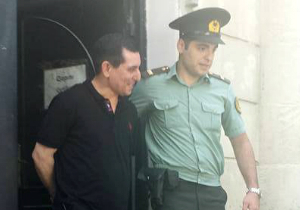 “Given the apparent effectiveness of this pressure, on the repressive Azerbaijani authorities, which has indirectly manifested itself in the later release of Amirli, whose health has been severely deteriorating in prison, the legislative and executive authorities of the leading Western countries should consistently apply similar sanctions and pressure. They must continue with these measures until all arrested journalists are freed from jail, and the restrictions on the freedom of expression in Azerbaijan are eliminated,” Huseynov concluded. IRFS states that currently the Azerbaijani government keeps in prison such critics as journalists Afgan Mukhtarli, Mehman Huseynov, Seymur Hazi, Aziz Orujov, Nijat Aliyev, Araz Guliyev, Fikrat Ibishbayli, Afgan Sadigov, Elchin Ismayilli, Javid Shiraliyev, Mahbub Zulfugarli, Ziya Asadli and Arshad Ibrahimov, bloggers Rashad Ramazanov and Ilkin Rustemzade, writers Saday Shakarli and Tofig Hasanov, as well as graffiti activists Giyas Ibrahimov and Bayram Mammadov. IRFS calls on the Azerbaijani authorities to release all of the critics mentioned above and ensure full freedom of expression in the country by the Constitution of Azerbaijan and the European Convention on Human Rights. IRFS calls on the international community not to soften the amount of pressure on the Azerbaijani authorities until they release other journalists from prison and put an end to the practice of revolving doors, in which new individuals are arrested instead of those released.